Businesses are more confident, and the pro-growth promises of President Trump are a big reason why. He says he'll cut taxes, loosen regulations and increase spending on infrastructure -- all things that tend to rev up investment. At the same time, the markets and economy were doing just fine before Election Day. Trump, of course, is not shy about taking credit. And it's no surprise that companies are touting their job announcements. But how much credit he merits for many of the individual corporate moves is more complicated. In many cases, the jobs he has promoted are part of previously announced plans. Here are the facts. On March 28, Ford announced a $1.2 billion investment in three Michigan facilities. What Trump said: The president sent a tweet touting a "big announcement" from Ford. "Car companies coming back to U.S.," he said. The facts: Ford said it plans to invest $850 million in its Wayne, Michigan, assembly plant. The company will also pump $150 million into its engine plant in Romeo, Michigan, and $200 million into a Michigan data center. Most of this investment was already agreed upon as part of a 2015 labor deal with the United Auto Workers union. At that time, Ford pledged to invest $700 million in Wayne and $150 million in Romeo, creating or retaining 130 jobs. So most of the news wasn't new. But the investment did ensure that the 3,700 workers in Wayne won't have their jobs shipped to Mexico anytime soon. On March 24, Charter Communications announced plans to invest $25 billion in the United States and to hire 20,000 American workers in the next four years. 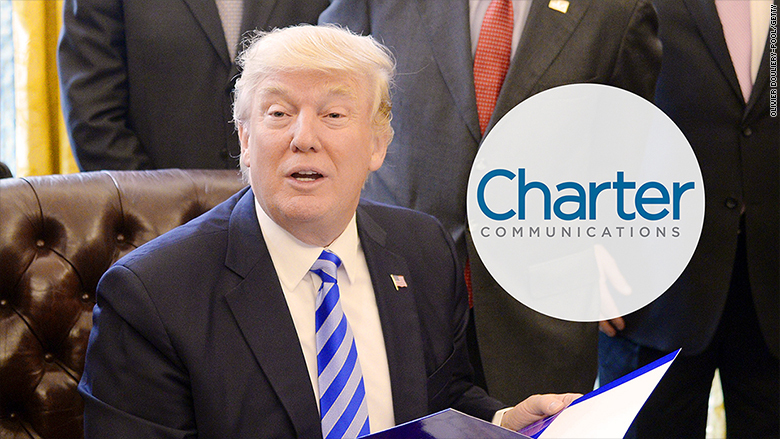 What Trump said: "Today, I am thrilled to announce that Charter Communications has just committed to investing $25 billion, with a 'B,'" Trump said in a joint announcement with the Charter chief executive in the Oval Office. He later tweeted his thanks. The facts: Charter, a telecommunications company, said it would invest $25 billion in broadband infrastructure and technology in the next four years. The company also committed to hiring 20,000 American workers during that period, and said it would bring back all overseas call centers and build a new call center in Texas. The FCC approved the deal last May, and Rutledge said in January that the company had plans to hire 20,000 new employees within three years. The $25 billion investment, Venech said, had not been previously announced. On March 15, GM announced that it's adding or bringing back 900 U.S. jobs in Michigan over the next 12 months. What Trump said: "Just today -- breaking news -- General Motors announced that they're adding or keeping 900 jobs right here in Michigan," Trump said at a Detroit-area campaign speech after meeting with automakers. He added that the number of jobs in the region "would've been heading down big league if I didn't get elected." The facts: Just under 700 GM workers laid off earlier this month will get their jobs back. GM plans to reinstate 500 jobs at its Lansing plant in 2018, and it's creating 180 plant jobs in nearby Flint for accommodate some who were fired. The company will also hire 220 new workers at its plant in Romulus. GM did not directly attribute the announcement to Trump or his policies. 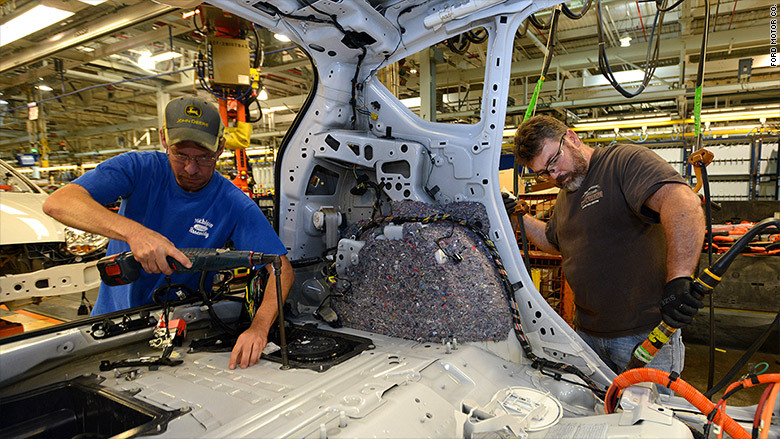 The decision was predicated upon a "strong economy with a strong manufacturing sector," GM spokesman Tom Wickham said, as well as "anticipated strong demand" for crossover vehicles. 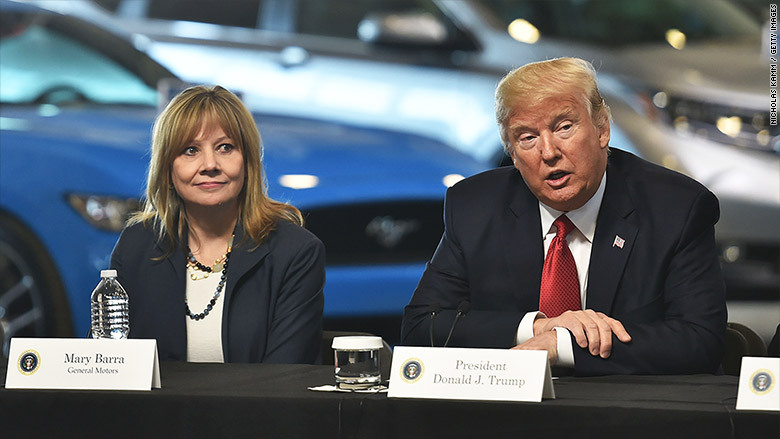 However, the announcement came hours before Trump flew to Michigan to talk about fuel economy rules with top automakers, including GM CEO Mary Barra. "Today's event gave us a positive venue to share good news," Wickham said. The carmaker already announced in January that it would invest $1 billion in U.S. factories and create or retain 7,000 domestic jobs. 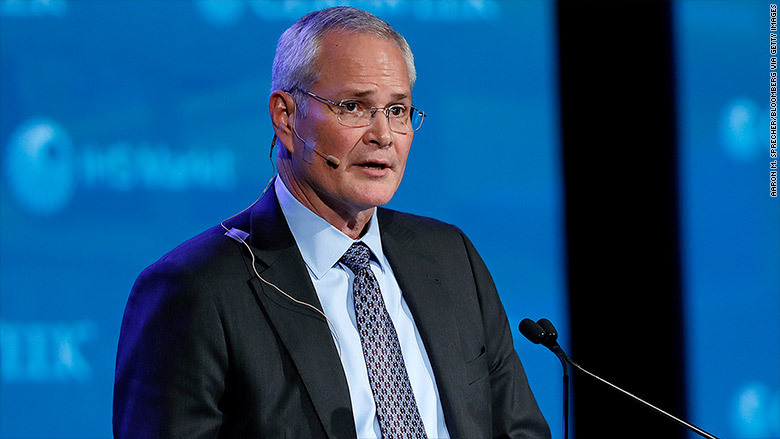 On March 6, CEO Darren Woods said the company is investing $20 billion in Gulf Coast manufacturing operations over 10 years, creating 45,000 jobs. What Trump said: Trump tweeted about the announcement five times, and the White House put out a laudatory press release. "This is a true American success story," the president said in a statement. Trump said in a video that Exxon's investment was happening "to a large extent because of our policies and the policies of this new administration." The facts: The jobs are part of an Exxon project called Growing the Gulf, which was launched in 2013 and aims to tap into the nation's shale boom. The company plans 11 natural gas projects along the Texas and Louisiana coasts. An ExxonMobil spokesman said he didn't know how many of the 45,000 jobs were created between 2013 and 2016. The investment is in line with Exxon's broader plans for growth. Woods has made natural gas a priority since he took the helm in January, and the company recently spent $5.6 billion to snap up shale assets in Texas and New Mexico. Exxon's press release announcing the jobs focused on the money to be made exporting chemicals linked to shale gas -- not on Trump. "These projects are export machines, generating products that high-growth nations need to support larger populations with higher standards of living," Woods said. "Those overseas markets are the motivation behind our investments." Still, Woods gave the White House a hat tip in a statement circulated by the president's team. "Investments of this scale require a pro-growth approach and a stable regulatory environment and we appreciate the President's commitment to both," Woods said. 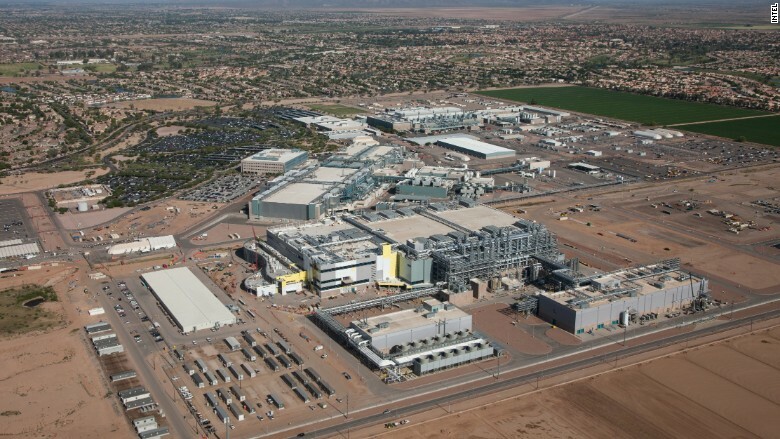 On Feb. 8, Intel (INTC) CEO Brian Krzanich announced at the White House that the tech giant would invest $7 billion in a new Arizona factory, creating 10,000 related jobs. 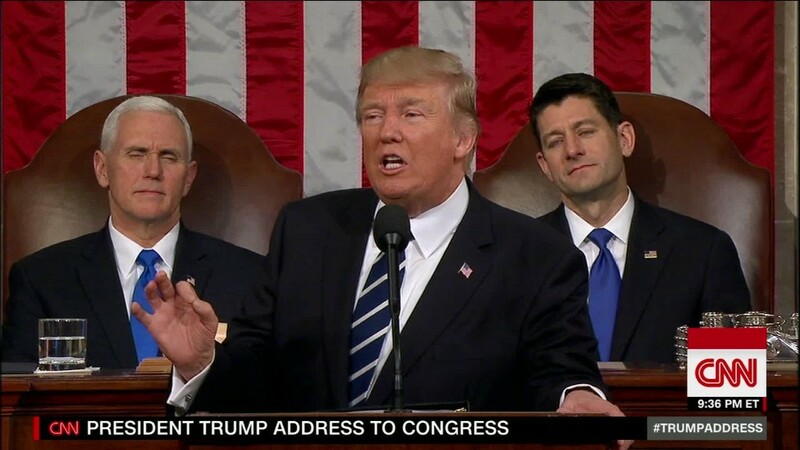 What Trump said: Trump said at a press conference after the announcement that Intel "will move ahead with a new plant in Arizona that it was probably never going to move ahead with, and that will result in at least 10,000 American jobs." Trump also promoted the Intel news at a joint press conference with the Canadian prime minister. Trump said Intel is "coming in with billions and billions of dollars of investment and thousands and thousands of jobs" because he's moved to lower taxes and decrease regulation. The facts: The new computer chip factory will directly create about 3,000 "high-paying, high-wage, high-tech" jobs at its peak, according to Krzanich. In total, it will support more than 10,000 related jobs in the state. 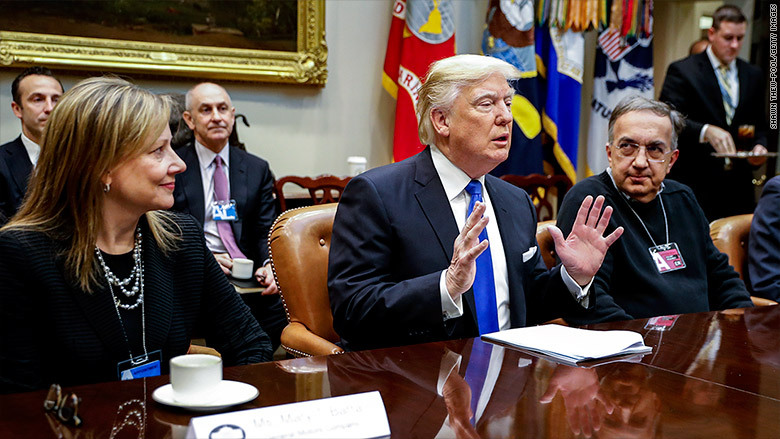 The investment was made "in support of the tax and regulatory policies that we see the administration pushing forward," Krzanich said from the Oval Office. But the project isn't entirely Trump's doing. In fact, Intel previously announced a $5 billion investment in the same Arizona chip factory with former President Barack Obama in 2011. That money was used to build the "shell" of the factory, but it was left unfinished because of a lack of "general demand for the product," according to company spokesman William Moss. The project is resuming now that demand is picking up again. "We're making this investment now to meet demand that we now expect," Moss told CNNMoney. "That said, we certainly join other companies in supporting the administration's pro-business and pro-investment goals." On Jan. 17, General Motors (GM) announced plans to invest at least $1 billion in U.S. factories. The company also committed to creating or retaining about 7,000 U.S. jobs in the next few years. What Trump said: Trump, then the president-elect, gave GM and Walmart a shout-out via Twitter the day of the announcement, thanking the companies "for starting the big jobs push back into the U.S.!" The facts: GM plans to shift 450 jobs from supplier plants in Mexico back to the U.S., and has pledged to protect 1,500 factory jobs that were previously at risk of leaving the country. GM is also adding 5,000 jobs to its finance and technology operations. Details will be rolled out later this year. The company didn't mention Trump in its announcement. "As the U.S. manufacturing base increases its competitiveness, we are able to further increase our investment, resulting in more jobs for America and better results for our owners," GM CEO Mary Barra said in a statement. These plans have been in the works for some time, according to a company executive, and aren't part of any arrangement with President Trump. Still, GM has been eager to show the new administration that it's serious about domestic job creation. Trump has attacked the automaker for making cars in Mexico and threatened to hit its imports with a "big" border tax. Barra serves on Trump's economic advisory council. On Jan. 17, Walmart (WMT), which employs more workers than any other American business, said it would add 10,000 U.S. jobs this year. What Trump said: Trump offered praise for Walmart in the tweet about GM. The facts: Walmart will add 10,000 jobs by expanding, renovating or relocating 59 Walmart and Sam's Club stores. It's also expanding online services. In addition, the project will create 24,000 temporary construction jobs, the company said. Walmart didn't mention Trump in its announcement. 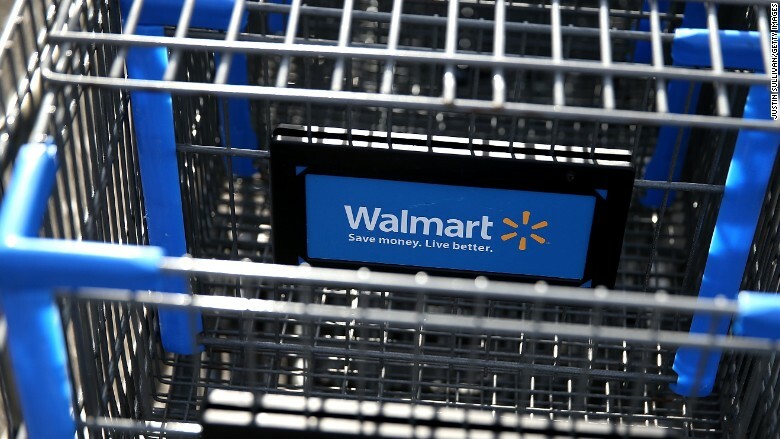 "With a presence in thousands of communities and a vast supplier network, we know we play an important role in supporting and creating American jobs," Walmart executive Dan Bartlett said in a statement. It's unclear whether Trump or his policies affected the decision, announced days before the inauguration. Walmart declined to comment. CEO Doug McMillon serves on Trump's economic advisory council. On Jan. 13, defense giant Lockheed Martin (LMT) said it would add 1,800 jobs to its F-35 fighter jet program in Texas. What Trump said: Trump mentioned Lockheed Martin's job creation in a Jan. 18 tweet. He said the jobs "came back because of me!" The facts: Lockheed Martin CEO Marillyn Hewson told reporters about the new jobs while leaving a meeting at with the president-elect at Trump Tower. 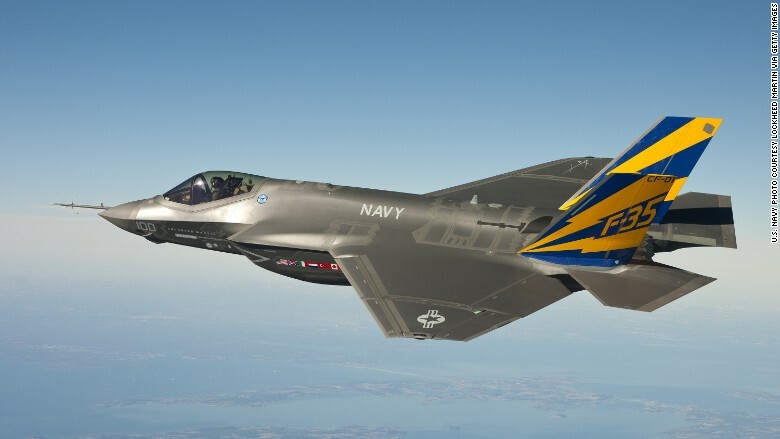 She said Lockheed is "close to a deal" that will bring down the cost of the F-35 and bring "thousands and thousands of jobs" to the U.S.
Trump criticized the cost of Lockheed Martin's F-35 program in late December. He said "the tremendous cost and cost overruns" led him to ask Boeing to price a comparable jet. Lockheed stock dropped. Lockheed has every reason to charm Trump: It is the largest U.S. government contractor, according to the most recent most recent data. But these new jobs would have been added with or without him. The positions Hewson announced are linked to production increases that have been in motion for years, a Lockheed spokesman told CNNMoney. Lockheed plans to deliver 150 jets in 2019, compared with 36 aircraft in 2014. On Jan. 12, Amazon (AMZN) announced plans to create more than 100,000 U.S. jobs in the next 18 months. What Trump said: "The announcement was made after the president-elect met with heads of several other tech companies and urge them to keep their jobs and production inside the United States," Sean Spicer, the incoming press secretary, said on a call with reporters that day. "The president-elect was pleased to have played a role in that decision by Amazon." The facts: Amazon didn't mention Trump in its press release. "Innovation is one of our guiding principles at Amazon, and it's created hundreds of thousands of American jobs," Amazon founder and CEO Jeff Bezos said in a statement. "These jobs are not just in our Seattle headquarters or in Silicon Valley -- they're in our customer service network, fulfillment centers and other facilities in local communities throughout the country." Amazon would probably add tens of thousands of jobs regardless of who is president. The e-commerce company is growing rapidly, and Amazon adds fulfillment centers each year to expand its shipping operations. "The bottom line is they were going to create jobs anyway, but it's the messaging that has changed," James Cakmak, an analyst with Monness, Crespi, Hardt, told CNNMoney. This announcement "appears to calibrate to current political sensitivities." 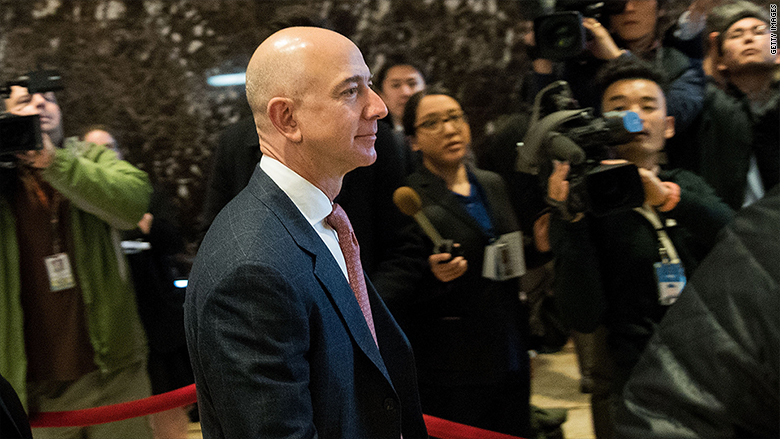 During the campaign, Trump repeatedly took on Bezos. He said once that Amazon is "getting away with murder tax-wise." 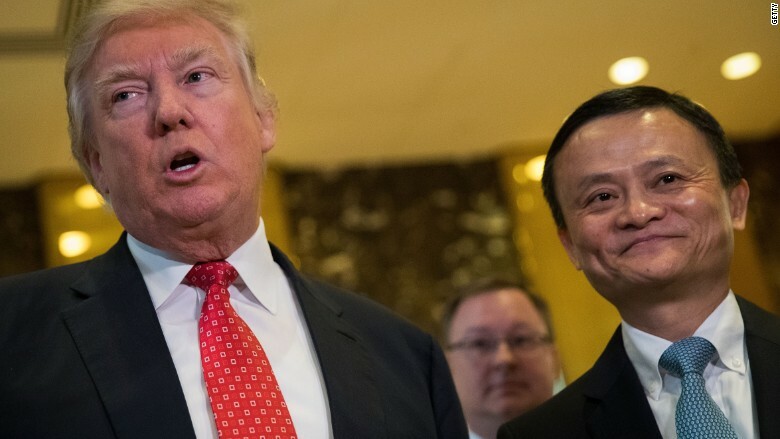 On Jan. 9, Jack Ma, the founder of Alibaba (BABA), met with Trump and promised to help create 1 million jobs in the U.S. through the company's e-commerce platforms. What Trump said: Ma "had no intention of doing it until I got elected," Trump said in an interview with Fox News. He also said Alibaba and other companies will spend a "tremendous amount of money" in the United States. The facts: Ma is on record as early as 2015 saying he wanted to create U.S. jobs by helping businesses sell American goods to China, and Asia generally, on Alibaba's e-commerce platform. After the January meeting, a reporter asked whether Ma and Trump talked about any investments in the U.S. "No," Ma replied. "We specifically talked about ... supporting 1 million businesses, especially in the Midwest of America." Alibaba's pledge to help create 1 million jobs in the U.S. is vague and misleading. Ma is not going to build factories. He is not planning to set up Alibaba operations centers that would employ tech-savvy Americans. And he is not touting a big investment. In other words, Ma isn't promising what most experts would define as job creation. He's talking about stimulating trade by helping 1 million small businesses sell American goods in China and Asia. Why the Midwest? Chinese consumers want more foreign food supplements and baby goods -- think milk products from a farm in Wisconsin. On Jan. 8, Fiat Chrysler Automobiles (FCAU) announced a $1 billion investment to expand factories in Ohio and Michigan, spurring the creation of 2,000 jobs by 2020. What Trump said: "It's finally happening - Fiat Chrysler just announced plans to invest $1BILLION in Michigan and Ohio plants, adding 2000 jobs," Trump tweeted the next day. The facts: The announcement is the latest phase in an "industrialization plan" the company announced a year ago. In a 2015 deal with the United Auto Workers union, the company committed to investing $5.3 billion in American plants to open up additional union jobs. 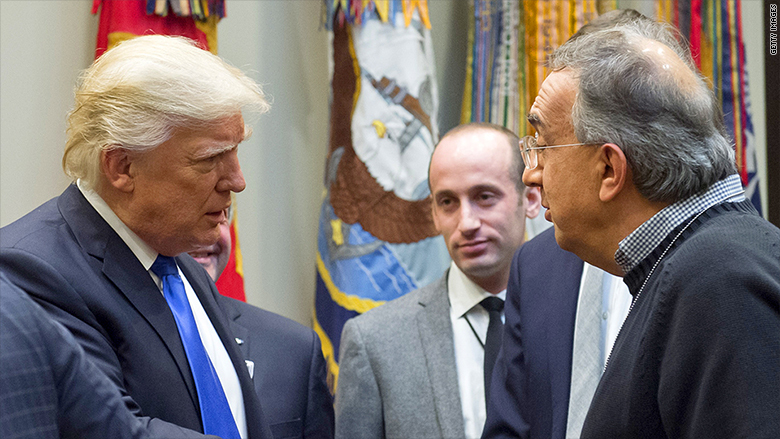 Fiat Chrysler CEO Sergio Marchionne said at a press conference that the decision was neither a response to Trump's pressure on the auto industry nor an effort to avoid Trump's ire. "I wish I could give him credit for this," Marchionne told reporters. "But the thinking was in place beforehand." Still, Trump's public criticism of GM and Ford factories in Mexico has surely made Fiat Chrysler and its investors wary. Marchionne called it "incredibly imprudent" for Chrysler to invest in Mexico until the industry gets some clarity on tariff threats. On Jan. 3, Ford (F) announced that the company is canceling plans to build a plant in Mexico. Instead, the carmaker will invest $700 million in Michigan to create 700 U.S. jobs. What Trump said: Trump hailed Ford's decision on Twitter the next day. "Thank you to Ford for scrapping a new plant in Mexico and creating 700 new jobs in the U.S.," he tweeted. "This is just the beginning - much more to follow." After Fiat Chrysler's announcement the following week, the president-elect applauded Ford again. "Ford said last week that it will expand in Michigan and U.S. instead of building a BILLION dollar plant in Mexico," he tweeted. "Thank you Ford & Fiat C!" The facts: The Ford Focus will now be built at an existing plant in Hermosillo, Mexico, and the $700 million investment in Ford's Flat Rock, Michigan, plant will allow the company to ramp up production of electric and self-driving cars. 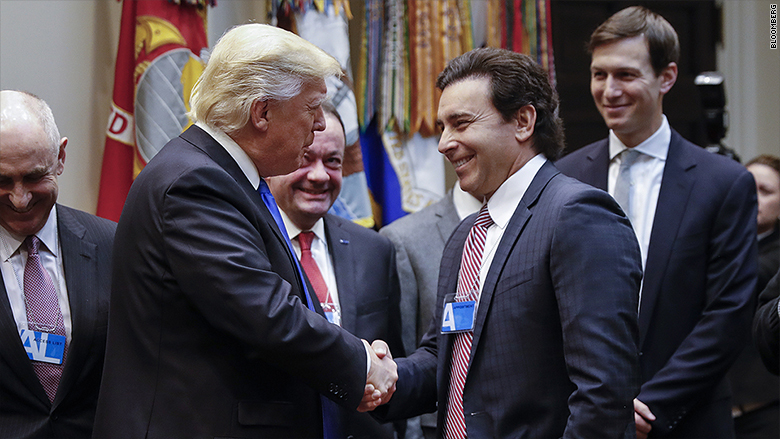 Ford CEO Mark Fields said the investment is a "vote of confidence" in the pro-business environment Trump is working to foster. However, he stressed that Ford did not negotiate a deal with the president-elect. "We didn't cut a deal with Trump," Fields told CNN's Poppy Harlow. "We did it for our business." Falling small car sales probably played a major role. At the same time, Trump's unrelenting criticism of Ford on the campaign trail could have been a factor. Last year, Ford announced that it would invest $1.6 billion to transfer production of the Focus from Michigan to Mexico as a cost-saving move. Trump repeatedly blasted the automaker for sending U.S. jobs to Mexico (Ford said no jobs would be lost because of the move) and threatened to place a 35% tariff on Ford vehicles made in Mexico and sold in the U.S.
On Dec. 6, after meeting with Trump, SoftBank founder Masayoshi Son pledged to invest $50 billion and create 50,000 jobs. What Trump said: The president immediately claimed credit, tweeting, "Masa said he would never do this had we not won the election!" The facts: Before the election, SoftBank (SFTBF)and the government of Saudi Arabia said they were forming a $100 billion fund to invest in tech companies around the world. Son told The Wall Street Journal that the money he promised to Trump would come from the SoftBank Vision Fund. A SoftBank spokesman disputed that Son said the investment would come entirely from the Vision Fund, saying, "it is a commitment from SoftBank." SoftBank announced it would pump $1 billion into Florida startup OneWeb on Dec. 19, a move it said would create 3,000 jobs over the next four years. The company described the investment as "the first step" in Son's promise to Trump. But it is not clear how much of the huge investment would have ended up in the U.S. regardless of who won the White House. The OneWeb deal wasn't cobbled together after the election. Softbank had been in talks with the startup for "a long time," said SoftBank spokesman Matthew Nicholson. 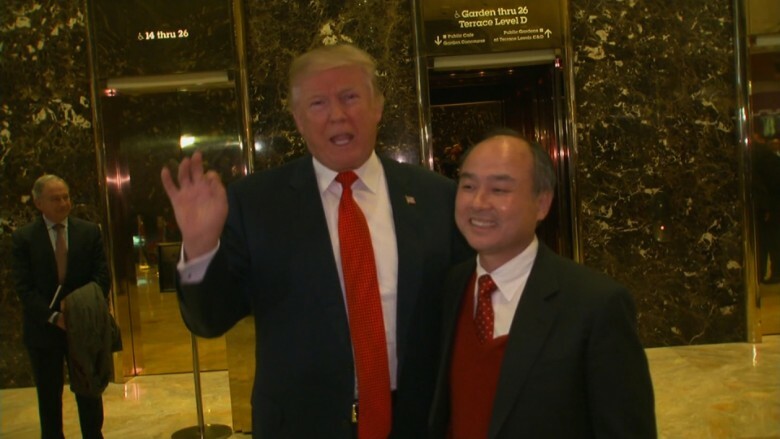 Sprint, which is also owned by SoftBank, confirmed late last year that it would "create or bring back to America" 5,000 jobs, also part of Son's commitment to create 50,000 jobs. On Nov. 30, air conditioning, heating and refrigeration company Carrier said it cut a deal with the incoming Trump administration to keep jobs in Indiana from moving to Mexico. What Trump said: Trump touted his team's involvement in the Carrier deal from the start. "I am working hard, even on Thanksgiving, trying to get Carrier A.C. Company to stay in the U.S. (Indiana)," he tweeted on Nov. 24. "MAKING PROGRESS." Once the deal was inked, Trump visited the plant to claim a victory. "Carrier stepped it up, and now they're keeping -- actually, the number is over 1,100 people," he said. "Which is so great." The facts: The company said the deal was possible because the incoming administration emphasized "its commitment to support the business community and create an improved, more competitive U.S. business climate." It also credits an incentive package offered by the state of Indiana. 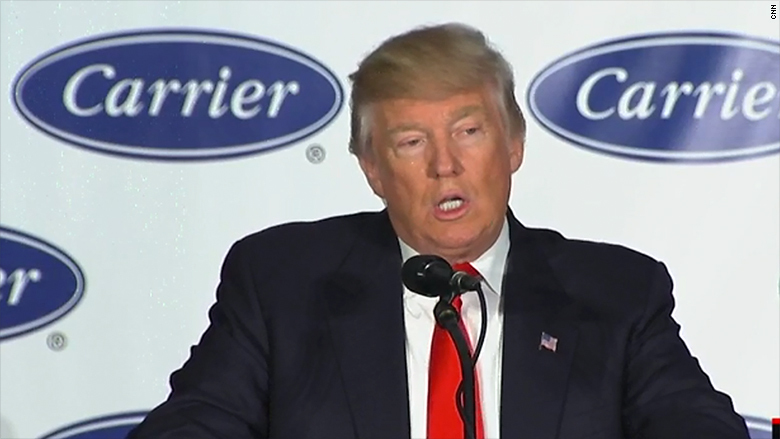 Carrier says the agreement really saved 800 jobs -- not 1,100 -- from moving to Mexico. The company confirmed to CNNMoney that it never planned to move 300 administrative and engineering positions from Indianapolis. Carrier will receive $7 million in financial incentives from the state of Indiana over the next 10 years -- a fraction of what Carrier expected to save if it moved the jobs to Mexico. Carrier's parent company, United Technologies (UTX), is a major defense contractor.